in a manner to provide protection equal to or greater than the sheathing and shoring required for the situation. 5. Ladders used as access ways should extend from the bottom of the trench to not less than 3 feet above the surface. Lateral travel to an exit ladder should not exceed 25 feet. 6. Backfilling and removal of trench supports should progress together from the bottom of the trench. Jacks or braces should be released slowly and, in unstable soil, ropes should be used to pull out the jacks or braces from above after all personnel have cleared the trench. 7. Minimum size and spacing of timbers for shoring of trenches should be maintained according to set standards (table 4-1). 8. Aluminum hydraulic shoring should be installed according to the manufacturer's recommendations. A scaffold is an elevated working platform for supporting both men and materials. It is usually temporary; its main use being in construction work. Scaffolds should be designed to support at least four times the anticipated weight of both men and materials that will use them. 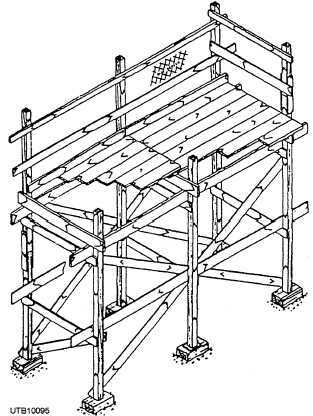 Scaffolding is a structure made of wood (fig. 4-29) or of metal (fig. 4-30) to support a working platform. Built-up and suspended scaffolds may be made of wooden structural members, but steel tubing should be the first choice. This type of scaffold affords a firm, solid work platform for use by one or more men. Their lightness, mobility, and ease of erection make them most suitable for light-duty to heavy-duty work, particularly when the equipment must be erected and dismantled frequently. Most scaffolds are in one of three primary categories: tubular, suspended, or rolling. They are also classified according to their intended use: light duty (working load must not exceed 25 pounds per square foot of platform surface), medium duty (50 pounds per square foot), and heavy duty (75 pounds per square foot). Figure 4-29. - Wood scaffold. and special couplers that serve to connect the uprights and to join the various members (fig. 4-30). 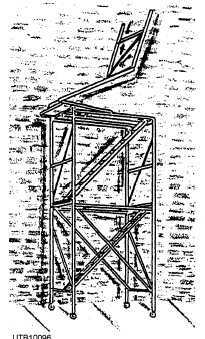 A suspended scaffold carries a working platform on beams and ropes that is secured to structural members or to thrust outs from the structure. Figure 4-30. - Folding sections with fixed platforms, guard rails, and built-in stairs.